Citation: Labate B. "Anthropology that flourishes outside the academy : Anthony Henman and the San Pedro cactus (Interview)." Jul 19 2012; Erowid.org/characters/henman_anthony/henman_anthony_interview1.shtml. which serves as the basis for his trips to the interior of Peru in search of the San Pedro or wachuma (Echinopsis pachanoi = Trichocereus pachanoi) cactus. Born in 1949, Henman has been a pioneer of the sociological discussion on psychoactive drugs in Brazil. A former professor at the University of Campinas, he has edited two compilations and written three books and several articles on psychoactives. His best-known work is probably Mama Coca, published in London under a pseudonym in the late 1970s. This is one of the first contemporary academic written discussions to address the issue of the indigenous uses of coca leaf (Erythroxylum coca) and criticize the authoritarian and ethnocidal rhetoric contained within the political agenda of the so-called "war on drugs". His curriculum vitae also includes research in Brazil on the use of diamba (Cannabis sativa) among the Tenetehara Indians of Maranhão, guaraná use among the Sateré-Maué, the União do Vegetal ayahuasca religion, and heroin and cocaine use in Europe and the United States, as well as an analysis of harm reduction policies (public strategies to reduce the problems caused by the consumption of psychoactive substances instead of demanding their complete ban). Beneath disheveled gray hair, Henman unceremoniously declares that he has definitively abandoned the academy. Above all he is an empiricist; or, in other words, a lover of plants. His favorites are coca and San Pedro, which he lovingly grows in his magic garden and prepares using techniques he has invented himself. He usually consumes San Pedro solo, in addition to the coca leaves he chews daily, as is customary in various traditional populations. It would be difficult to detail his vast curriculum of psychedelic experiments, which includes a near-overdose on heroin when he was researching "junkies". BL: Isn't the term wachuma also used to refer to the plant? "Wachuma is the ancient Indian name of San Pedro. The first detailed description of its use was made by Father Bernabé Cobo, a Jesuit who studied plants, animals, and minerals in the seventeenth century. The change of name to San Pedro has to do with the mestizo use of this plant, which has developed over the last 200 to 300 years." AH: Wachuma is the ancient Indian name of San Pedro. The first detailed description of its use was made by Father Bernabé Cobo, a Jesuit who studied plants, animals, and minerals in the seventeenth century. The change of name to San Pedro has to do with the mestizo use of this plant, which has developed over the last 200 to 300 years. BL: When was mescaline identified in the San Pedro cactus? AH: This is an interesting question, because mescaline in San Pedro was not identified immediately. Mescaline itself had already been isolated in the 1890s in Germany, from peyote (Lophophora williamsii). After this time, poets and intellectuals experienced a hallucinogenic effect for the first time in the modern industrial era. Parallel to this, in the 1930s, the San Pedro E. pachanoi variety was widely distributed as a botanical curiosity and as a base for grafting other species of cacti, and thus it became present in most cactus nurseries worldwide. But this occurred before people realized that this species contained mescaline. Although the traditional uses of San Pedro existed in Peru, botanists were not very interested in researching them. In the 1940s, a number of doctors in Lima suggested that there could be mescaline in San Pedro, but they could not carry out the necessary tests. It was only in 1960 that mescaline was positively identified, and the findings were published. Compared to the discovery of psilocybin-containing mushrooms, of the mescaline present in peyote, or LSD, this came relatively late. BL: And what is the legal status of mescaline? BL: Social scientists insist it is necessary to study the consumption of drugs from a model that takes into account the set (expectation of the individual) and the setting (social context) as opposed to more strictly medical and pharmacological approaches, which usually dominate the public debate. Why have you criticized the model of set and setting? AH: Norman Zinberg established these concepts during the 1960s. His research was important because it demonstrated that people could have an unproblematic relationship with opiates, which at the time were considered to be the last straw and which inevitably led to addiction, etc. However, from the theoretical point of view, the separation between these spheres came from the behaviorists, an American school of psychology whose roots, in the 1940s and 1950s, took on a little thought out division between "mind" and "body". Set and setting are, in fact, a repetition of this dualism: the expectations of the subject (set) represent the mental aspect, and the cultural environment (setting) represents the body. When these concepts are fetishized, you end up with a somewhat mechanical model: there is a substance X, which, combined with an expectation Y, and an environment Z, will produce such an effect. But when we analyze the experience of a person, we see that the situation is more complicated than that. There are many feedback loops, things that come from the head and go to the body and vice versa. It is very difficult to say exactly whether a sensation that is in the body comes from a cerebral euphoria, or vice versa. I prefer a model where one assumes that the effect of a substance is somewhat unpredictable. Man will never be totally able to domesticate the experience. This magic is, from the indigenous South American point of view, what is known as the "spirit of the plant". This spirit is autonomous and has its own strength. And this is beyond the division of mind and body. I support the concept of planta maestra or teacher plants, the plant that teaches, which reduces the human arrogance that says that everything can be controlled through physical and mental discipline. BL: What are the different techniques of preparing San Pedro? AH: We began by examining the relationship that the Andeans have had with San Pedro from the earliest pre-ceramic periods, 3000-2000 BC. Remains of dry plants have been found in various excavations on the Peruvian coast. But in these places wachuma does not naturally grow, as it only grows at between 2000 and 3000 feet. Given the transportation conditions of the time, and considering that a walk from the mountain to the shore would be at least 80 kilometers, is very unlikely that the cactus was transported in its green state. This was probably how the technique of leaving San Pedro to dry in the sun first came about. Regardless of the archaeological records, what now happens most in Peru is that the fresh cactus is cut into slices and then cooked for several hours. After it is strained, the solid parts of the plant are eliminated, leaving the viscous liquid. Recently, a number of people, myself included, have rediscovered the original technique of drying the plant before cooking it. "In general, I leave a San Pedro cutting six months without water at the beginning, to develop its roots." BL: Are there other plant species that are added to the San Pedro brews? AH: In the tradition of northern Peru, the healers use plants called michas, which they say increase the power of the beverage. They are used to "follow the trail" (rastrear in Spanish), which means to follow a track for the treatment of diseases caused by magic. It is said that the use of these plants facilitates the interpretation of the hallucinations of the healer and the patient. But several of these plants have no psychoactive effect, that is, they only have "symbolic efficacy". Those that do have some psychoactive pharmacological content belong to the Solanaceae family, especially Brugmansia, which are concentrated in northwestern Amazonia and in areas near the Andes. Brugmansia candida is a variety with white flowers that we see in the Serra do Mar and the Mantiqueira hills near São Paulo. Another popular garden plant in Amazonia is the toé (B. suaveolens). BL: You are a collector of San Pedro. What is your experience of growing it? AH: It likes a well-drained ground, with a little sand and stone. In general, I leave a San Pedro cutting six months without water at the beginning, to develop its roots. Once the roots have developed, the plant must have a system similar to that of the Brazilian savannah, the cerrado: reasonable rains for six months, and six full months of drought. When we cultivate these plants in the privacy of our own gardens, they end up becoming characters, with their own personalities. 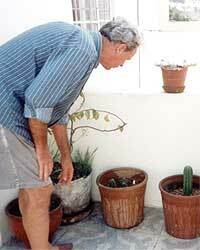 Every day when I wake up I have a moment of concentration in front of the plants; I have a relationship with each of them. Furthermore, for the sake of fertilizer, but also for magical reasons, I place compostable plant offerings around the San Pedro--like the ends of cigarettes, tea, coffee, mate leftovers. It seems that the cactus likes them. BL: Describe a little more of your garden. AH: In Lima, I have a hundred plants in pots of different sizes. Some are already two or three meters high and others are seedlings that I have just collected and are in small pots, developing well. In England, which has a less favorable climate (wet and cold), I artificially created an Andean dry winter. Between October and March I do not water them and leave them inside, where they receive heat and sun. During the European summer I leave them outside. As it rains a lot, it ends up being like the summer of the mountains in Peru. But in Lima the cactus grows twice as high. BL: What is known about the pre-Columbian indigenous tradition of the consumption of San Pedro? AH: There is archaeological evidence that San Pedro was ritually used during the Chavín Horizon, among one of the earliest civilizations in Peru, around 800 BC, especially in the ceremonial center of Chavín de Huántar. In this place there are representations of priests holding cactus in their hands, but it is difficult to know the details of the ritual that was practiced there. It probably included a moment of concentration in a patio outside the pyramid, and then people went inside, where there were a series of small corridors and rooms and a very complex system to bring in air and water, which produced very interesting sound effects inside the pyramid. You can visit these places: I've been there and I can say it's fascinating! Then participants were likely led to a large stone monolith that represented their greatest divinity, a big feline--more than just a jaguar--with the attributes of a snake, birds, and other animals. The archaeologist Richard Burger of Yale University says that the ritual also included the consumption of another substance. I agree with his belief, when he says that at the moment of highest intensity they probably sniffed a dosage of paricá. BL: What is paricá? What is the evidence that it was consumed together with San Pedro? AH: Paricá is a powder prepared from the seeds of Anadenanthera peregrina, a very common tree in the jungle, which grows from the Andes to São Paulo. This seed contains dimethyltryptamine, an active chemical also found in ayahuasca (Banisteriopsis caapi + Psychotria viridis). When you take the San Pedro and add paricá, the trip takes on a marked change in the visual field. The effect of paricá lasts half an hour at most. Probably at this point people were placed before the feline image. This theory is based on the existence in Chavín of a series of heads embedded in the walls of the pyramid in various stages of transformation: from a fully human head to a totally dragon-like feline. The metamorphosis, as various researchers have shown, is clearly associated with swelling of the nose. So my interpretation is that, when you add the paricá, which is sniffed, a feline transformation is produced, a true "incarnation" of the tutelary spirit of worship. There is also considerable evidence of the combined use of San Pedro and paricá in other cultures that appeared later in the Middle Horizon in Peru among the Mochica, the Nasca, and the Wari.
" ...evidence from Chavín encouraged me to carry out experiments with myself and at least twenty people under my supervision. All seemed to agree that the combined effect of San Pedro and paricá is more interesting, leading to more unusual spaces than those caused by either substance separately. " BL: But paricá and San Pedro are not always consumed together. AH: True. The paricá "tablets", a sort of tray from which one sniffs the powder, were also widely distributed in pre-Hispanic times in the Andean south, right to northern Chile and northern Argentina. It is not definitively known whether the cactus was also used. For this region, it is difficult to determine whether the two plants have always been associated with each other, or, in some cases, used separately. In the case of Amazonia, it is clear that paricá was used without San Pedro, in an extensive area that included part of Brazil. But the evidence from Chavín encouraged me to carry out experiments with myself and at least twenty people under my supervision. All seemed to agree that the combined effect of San Pedro and paricá is more interesting, leading to more unusual spaces than those caused by either substance separately. BL: Is there historical evidence that the Incas used wachuma? This idea seems to be common currency among contemporary esoteric groups. AH: There is absolutely no historical evidence to that effect, as there is no archaeological or ethnographic evidence that the Incas consumed ayahuasca. It is, however, certain that they used coca leaves and ate ground paricá seeds, mixed into chicha, a fermented maize drink. BL: What are the characteristics of the mestizo consumption of San Pedro by the maestros (healers) in northern Peru? AH: The consumption of San Pedro was marginalized by the missionaries, who closely linked it to witchcraft and satanic rites. The new mestizo practices, which likely adopted the term San Pedro in reference to Christian symbolism, and with the clear aim of legitimizing its consumption, emerged from a prior tradition, with indigenous roots, but which was strongly affected by Spanish colonization. The Indian practices were reworked, using not only Christianity but also esoteric Mediterranean magical concepts, which, in turn, incorporated Arab, classical, pagan, cabalistic, and other elements. This new type of use remained sociologically invisible until the 1930s, when it was seen as part of Peruvian folk medicine traditions, and is now fully accepted as part of "popular culture". BL: Healers work a lot with the idea of witchcraft, to which they often assign responsibility for illness and death. How do you see this system? AH: It can work very well for certain types of psychic states, depressions, etc. It has the benefit of giving the person the feeling that they are confronting something evil and managing to get rid of it. The problem is that things are explained within a somewhat paranoid framework: everything is the result of bad and negative influences. The dominant theme is that of envy. I have often heard: "Todo es envidia!" ["Everything is envy!"]. BL: In the tradition of northern Peru do both the patient and the healer take the San Pedro? AH: Yes, but the amount of San Pedro that the participants take is not strong enough to produce marked effects. The healers know the real effect of San Pedro as they do their dietas [certain behavioral and food restrictions] and take it regularly, with greater amounts and in higher concentrations. But the vast majority of their patients take the plant for almost symbolic reasons. This is also clear in another aspect of the ritual, which is the singada [or singado]. This is a preparation of aguardente (sugar cane liquor) with tobacco snuff, San Pedro, água florida (perfumed flower water) and other scented water, which is inhaled through the nose by means of a shell. Such a mixture burns inside like pepper, clears the head, but does not have hallucinogenic effects. The singada may be a kind of symbolic remnant of what previously would have been the use of paricá associated with wachuma. BL: Considering that indigenous traditions surrounding the consumption of various classic hallucinogens such as ayahuasca, mushrooms, and peyote have endured, why is it that in the case of San Pedro, only the mestizo branch has remained? AH: I don't have a proper explanation. What historically happened was that the use of San Pedro started to occur in an area with predominantly indigenous populations in racial terms, but with local cultures greatly affected by the adoption of European values. The number of people participating in rituals with San Pedro is much higher when compared to those who consume ayahuasca, paricá, peyote, or mushrooms. The cactus is literally used by tens if not hundreds of thousands of people, while the other hallucinogenic cults have remained linked to indigenous contexts, which are relatively restricted in numerical terms. So it is curious that the literature on the use of San Pedro is so limited when compared with that of ayahuasca.
" I think mescaline allows for a looser ritualization and doesn't require a discipline as strict as that of ayahuasca. Its effect is more sober, less daunting for the person who takes it for the first time. A kind of ritual appropriate for San Pedro would have to take into account the fact that the effects last a long time and it also takes a long time to kick in. " BL: It is also striking that San Pedro has gained less prominence in the artistic and political countercultural environments and amongst psychonauts throughout the world. How do you explain the relative invisibility of wachuma? AH: This is somewhat relative. There are groups in California, Texas, Spain, and southern France, or even in Lima, using San Pedro in a "non-traditional" way. But they are not as visible for at least two reasons. The first is that there is no "pure" Indian San Pedro tradition to serve as a kind of symbol, as with the Huichols and peyote, and the Mexican Mazatecs and mushrooms, or the indigenous groups of western Amazonia and ayahuasca. The model that exists now, with its echoes of medieval magic, mixes badly with the vision of those alternative types who are interested in this kind of stuff. Another reason is that, in the present mestizo tradition, as I said before, the plant is prepared in a very weak form. So, a number of people have returned from Peru and said that the substance "does not hit" them. It would be interesting to create a new ideological environment for the San Pedrito, and I'm personally working on it. There has not yet appeared a new religion around San Pedro, and I think this is even positive. I would not like to see it becoming a kind of Santo Daime [a Brazilian ayahuasca religion]. BL: Why? In your opinion, what is the ideal situation to consume San Pedro? AH: I think mescaline allows for a looser ritualization and doesn't require a discipline as strict as that of ayahuasca. Its effect is more sober, less daunting for the person who takes it for the first time. A kind of ritual appropriate for San Pedro would have to take into account the fact that the effects last a long time and it also takes a long time to kick in. After two hours you still don't feel it completely, and it only "hits" from the third, fourth, or fifth hour. Then there is a relatively long period, for a good four hours, in which you are in the "heart" of the experience. And over another three or four hours the effect decreases. It would be good, then, to organize activities according to these three stages. In the first hours, people often feel a lowering of blood pressure, sleepy, and cold. They have to be livened up -- I can imagine a kind of ritual activity such as music, dance etc. could help to bring out the strength of the beverage. In the main phase, silence would be good, giving the chance for each person to get into their own thing, to have their visions. In the decreasing phase, it might be possible to combine the effect of San Pedro with other substances such as marijuana, coca leaves, alcohol, so as to leave the experience in an orderly fashion... to help in landing back. BL: How would you describe the "personality" of San Pedro? What does it mean to you? AH: In the first 25 years, I took it very sporadically, maybe once every five or ten years. In this period, at times it hit me hard and sometimes not. I started taking it more seriously beginning in 1996, and since then I have been taking it on average once a month. The cactus grows beneath the merciless rays of the sun. It has great solar energy, and you feel that yellow-orange color. This is also reflected in the type of visual changes that San Pedro produces, many of which have a mandalic form. These forms usually have a center, and are balanced, stable, while tryptamines (mushrooms, ayahuasca, LSD) produce visual changes with twists, more like snakes, little tails that disappear, vanishing spirals. It is very important for me to take San Pedro. Firstly, to maintain a certain physical well-being. I feel that each experience provides me with a "general overhaul". It is as if the thorns of the cactus penetrate every small space of my body, adjusting it and aligning it. I believe it also clears the head. I can better understand my amorous and professional obsessions, etc. And some small doors at the back of our minds connect to others, linking up, evoking memories and thoughts that do not normally appear. BL: Could you make a typical invocation to San Pedro, a prayer, song, or reference associated with it? AH: For me, two phrases that come from the traditional context of northern Peru show the wisdom of San Pedro. One is: "Let's arise! Let's arise!" Here we have the idea that San Pedro helps you to arise, strengthens you, makes you face things. It has a lot to do with the strength that comes from the cactus. The other thing they always say is: "Let's make the paths flower". The idea being that of a flowering of possibilities, such as developing a piece of work or a relationship, and making it flower. The metaphor is good: plants are born to flower, and we should act in the same way. Arise and flower. CAMINO, Lupe. Cerros, Plantas y Lagunas Poderosas. La Medicina al Norte del Perú. Piura, CIPCA, 1992. CHIAPPE, M., LEMLIJ, M., and MILLONES, L. Alucinógenos y Shamanismo en el Perú contemporáneo. Lima, El Virrey, 1985. GIESE, C. "Curanderos", traditionelle Heiler in Nord-Perú (Küste und Hochland). Münchner Beiträge zur Amerikanistik, Hohenschaftlarn, Klaus Renner Verlag, Vol. 20, 1989. GLASS-COFFIN, B. The Gift of Life: Female Spirituality and Healing in Northern Peru. Albuquerque, University of New Mexico, 1998. JORALEMON, Donald, and SHARON, Douglas. Sorcery and Shamanism: Curanderos and Clients in Northern Peru. Salt Lake City, University of Utah Press, 1993. POLIA, Mario. "Despierta remedio, cuenta...": adivinos y médicos del Ande. 2 Vol. Lima, F. Editorial, Pontificia Universidad Católica, 1996. POLIA, Mario. Las lagunas de los encantos: Medicina tradicional andina del Perú septentrional. Lima, Gráfica Bellido, 1988. SHARON, Douglas. "The Cactus of the Four Winds", in: FURST, Peter T (ed.). Flesh of the Gods. Praeger, Nova Iorque, 1971. SHARON, Douglas. Wizard of the Four Winds: A Shaman's Story. Free Press, Nova Iorque, 1978. Originally published in: Revista de Estudos da Religião (REVER), 1(4). São Paulo, PUC, 2004. Available at: http://www.pucsp.br/rever/rv1_2004/t_labate.htm. PhD in Anthropology and Researcher with the Interdisciplinary Group for Psychoactive Studies (NEIP - www.neip.info). For more information, see: bialabate.net. Results from several investigations of Echinopsis [= Trichocereus] pachanoi have shown fresh plants to contain a mescaline content ranging from 0.025% to 0.12%, and the two other species mentioned also vary in their mescaline content (Trout 2005). Plants with traditional shamanic use may generally contain higher levels (Ogunbodede et al. 2010); nevertheless, natural products often vary in alkaloid content, due to both genetic and environmental factors. The US Federal Exemption of the nondrug use of peyote in bona fide religious ceremonies of the Native American Church does not require that members of the NAC have Indian blood; however, the state laws vary. In Idaho one must have some Native American ancestry, and in Texas one must be considered to have at least 25% Native American ancestry; other states are more relaxed: in Arizona and Oregon, one need not belong to the NAC or any other formal religion--anyone of any race can use peyote if they do so with sincere religious intent (Shulgin et al. 2011). v 1.0 - 2004 - Labate B - Original Portuguese text. v 2.0 - Jul 19, 2012 - Labate B - Translated and adapted for Erowid.org, with Notes.